Open-Xchange offers an advanced, powerful yet intuitive and simple-to-use interface that allows you to view all your business and personal email, calendar, tasks management, contacts and document storage in one place. A smart collaboration solution with outstanding scalability and performance. 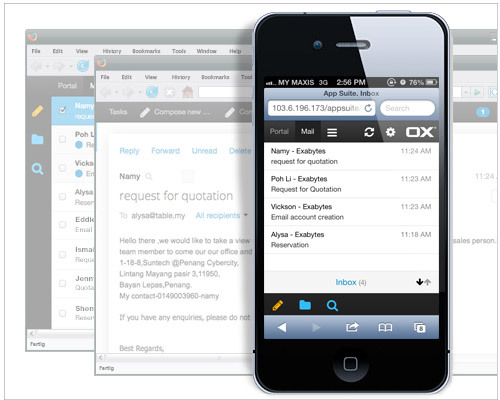 Open-Xchange webmail is optimized to fit perfectly on a mobile phone browser, giving you the convenience to navigate your emails smoothly on the clean webmail interface, while your address book is capable of collecting incoming and outgoing email addresses automatically. Manage emails, calendars and contacts from a central interface. Adapts automatically to any device you use. Try out our Free Trial Program to explore the Open-Xchange functionalities. Supports all major mobile operating systems including iOS, Windows Mobile, Android and Blackberry. Create reminders and tasks or assign work to team members. No migration of email accounts is needed; all you need is a simple connection through IMAP. What is the maximum allowed number of recipients in Open-Xchange (Qmail)? The maximum allowed number of recipients for Qmail is 25. This means that any email sent via Qmail will allow a combined total of 25 recepients (To: CC: BCC) per e-mail sent. These limitations cannot be changed, to prevent the risk of detection of spamming and being blacklisted. What is the maximum mail size allowed in Open-Xchange (Qmail)? The maximum mail size incoming and outgoing allowed in Open-Xchange is 50MB. Go to Settings tile on your phone. Select email+accounts, then add an account. Make sure that “Outgoing server requires authentication” option is checked. NOTE: This configuration is for the normal Open-Xchange product. If you use OXaaS, please check the configuration settings here. How do i solve the following error: "Validation of server imap.gmail.com failed due to invalid credentials" while setting up a Gmail account in OX? If that works go to https://accounts.google.com/b/0/DisplayUnlockCaptcha and \"Allow access to your Google account\"
Try to add the account again in OX and switch back to Gmail. You should have received a warning email from Gmail with the ominous text \"Someone has your password\". Check if it was a sign-in attempt from Berlin and click on \"Yes, that was me\"
What is the URL to the webmail for OX (hosted by LuxCloud) link?